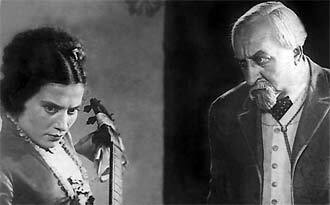 Filmed in 1937, the Russian Without Dowry was released in America in 1946, one year after the death of its director, Yakov Protazanov. Produced on a far-less epic scale than most Protazanov films, this is a merciless satire of the Russian dowry system in particular and the Czarist regime in general. The heroine (Nina Alisova) is promised in marriage to a bureaucrat (Victor Balikhin), who is interested only in receiving the girl's dowry. Maintaining a gently comic tone throughout most of the proceedings, the story dovetails almost imperceptibly into tragedy. The musical score is based upon Tchaikovsky's Pathetique, with a few Russian folk songs woven in.